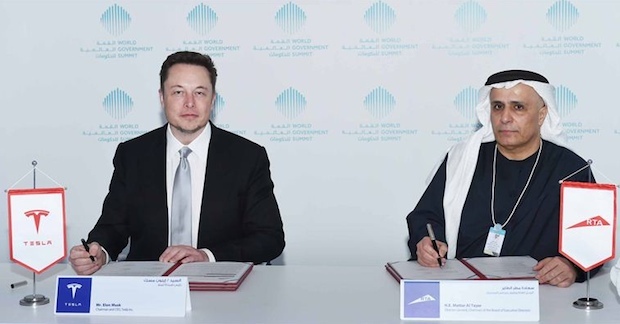 Just a day after launching in the UAE, electric car firm Tesla has signed a deal with Dubai’s Roads and Transport Authority for 200 electric vehicles. The purchases will include the manufacturer’s Model S sedan and Model X SUV, launched in the UAE yesterday, which will add to the limousine fleet of Dubai Taxi Corporation. The deal comes following a previous commitment from the Dubai government to make up to 10 per cent of its new fleet orders electric and hybrid vehicles. Mattar Al Tayer, director general and chairman of the RTA, said the vehicles would be equipped with autonomous driving hardware – an apparent reference to Tesla’s Autopilot system designed to takeover from drivers on highways. “The agreement also reflects RTA’s efforts towards providing driverless transportation solutions through undertaking technological tests of autonomous transit means,” said Mattar Al Tayer, director general and chairman of the RTA. He added that a test run of Tesla autonomous vehicles would be carried out in the country as part of efforts to make up to 25 per cent of all transport journeys in Dubai autonomous by 2030. Tesla announced on Monday it would begin accepting UAE online orders for its Model S and Model X vehicles. The company said it expected the first orders to be delivered in Dubai this summer. The company has also setup a popup store in Dubai Mall and has plans for a service centre. A second store and service centre are planned to open in Abu Dhabi next year.